Some of Anita's messages have been recorded and we would love to share these teachings with you! Anita Pearce reads through her book "Following Jesus" - recorded for you to listen to on cd. 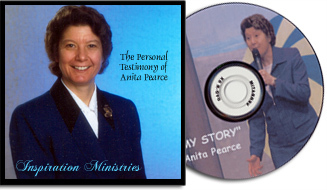 Get your copy of Anita Pearce's personal testimony on cd. You can also listen here online to Anita's Testimony! "My Story" by Anita Pearce is available on DVD! Order your copy of this powerful message to share with others the story of God's goodness working in her life.